KEY WEST, Florida (PRWEB) – For those dreaming of escaping their daily existence, Key West Seaplanes offers just the solution! A visit to the company's newly expanded official website is an escape in itself! You won't get your feet wet and you don't even have to leave your desk! The exclusive company offers expanse options for seaplane flights in Key West and charters throughout Southern Florida, The Bahamas and Caribbean. The company is owned by Julie Ann Floyd and Nikali Pontecorvo, both long-term Key West locals. Floyd excitedly shares, "The expansion of Key West Seaplanes Official website allows visitors to explore photos and descriptions of our flights and charters to help them choose the perfect seaplane or airplane flight to meet their needs." She adds, "Many people don't realize how easy it is to travel by seaplane from the mainland of Florida to Key West…it's very convenient, comfortable and absolutely beautiful!" New web pages showcase flights the company has been offering since starting business in 2009. This includes private seaplane flights to Little Palm Island, Hawks Cay and Cheeca Lodge from anywhere on the mainland of Florida or The Keys. Pontecorvo states, "What a way to arrive! One of our seaplanes is the way to go!" Newer services that include Key West Seaplanes Island Hopping flights are featured as well. The company is a proud recipient of a coveted tourism grant from VISIT FLORIDA, the state of Florida's official source for travel planning. "Our Island Hopping web page shares photos of different Island Hopping stops all along The Florida Keys," states Floyd. "It also offers examples of different day trip options for those considering such a magnificent and unique experience". Floyd conjectures that Key West Seaplanes received the tourism grant since the company's Island Hopping flights promote tourism to all of The Florida Keys, not just Key West as the only destination. Floyd also says "The Florida Keys are so amazing and unique. Often as people are driving from the mainland to Key West they may be in a rush to reach Key West and may not take time to experience all the unique stops along the way….We can change that by hopping from one island to another via seaplane!" Key West Seaplanes offers private seaplane flights for aerial sightseeing of The Dry Tortugas via seaplane. Of course, this is the home of Fort Jefferson, Garden Key, and Loggerhead Key. The company's focus is on the aerial sightseeing of these remote destinations which is ideal for those desiring to see the amazing Dry Tortugas and Ft. Jefferson but who do not wish to spend time on the ground at the fort. The company's seaplanes take passengers direct from Key West with ample opportunity to see wildlife in the water as the seaplanes fly at 500 feet near the uninhabited islands just west of Key West and the famous Marquesas. 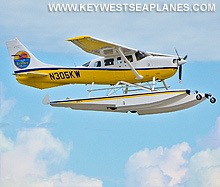 Key West Seaplanes Official website boasts, "With our private seaplane flights you won't even get your feet wet. You'll enjoy a private and peaceful seaplane flight complete with an engaging conversation of local history. Each passenger in our private seaplane flights has a window seat and each person enjoys an aviation headset to ensure a quiet and comfortable ride." The new Custom Lighthouses Flight page showcases a service that Key West Seaplanes has been doing for years, The Custom 8 or 10 Lighthouses Flight. Many people find it's the best way to see South Florida's famous lighthouses! Some favorites that are included- Sand Key Lighthouse, Key West Lighthouse, Sombrero Key Lighthouse, American Shoals Lighthouse, Alligator Reef Lighthouse, Loggerhead (Dry Tortugas) Lighthouse, Garden Key (Fort Jefferson) Lighthouse, Carysfort Reef Lighthouse, Fowey Rocks Lighthouse and the amazing Cape Florida Lighthouse. Some passengers like to pair their private flight with a stop for lunch at an eclectic little restaurant along the way. There are up to 10 Lighthouses within an easy flight from Key West or Miami/The Mainland. Key West Seaplanes private Little Palm Island seaplane service offers one-way and round trip flights to/from the internationally- acclaimed Little Palm Island from anywhere on the mainland or The Keys. Passengers enjoy low-level aerial sightseeing en route to Little Palm Island, though some choose to fly direct to reach their private tropical getaway as soon as possible and without delay. The company routinely flies passengers for breakfast, lunch, brunch, dinner and also for extended overnight stays. New web pages share photos, descriptions and updated booking options. The company plans further expansion to their Official website within the next two weeks, just in time to kick off yet another season of flying in paradise!